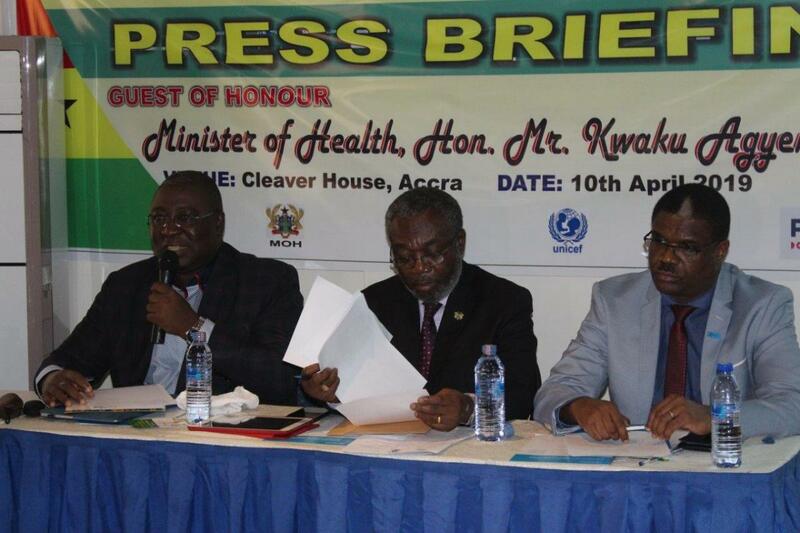 Ghana has announced the roll out of the Malaria Vaccine Implementation Programme in a press briefing held on 10th April 2019 in Accra. The event was attended by the WHO Country Representative Dr Owen Kaluwa and other Officers from the Country Office, the Director General of the Ghana Health Service Dr Anthony Nsiah- Asare, Officials from the Expanded Programme for Immunization (EPI), representatives of MVIP Evaluation Partners, Officials from Foods and Drugs Authority (FDA), Coalition of NGOs in Health, representatives from UNICEF and a cross section of media from print, TV and Radio. In his address, the Director General indicated that Ghana had made significant gains in the various intervention strategies against Malaria over the years. Notwithstanding, Malaria is still a high burden Public Health problem in Ghana with high case incidence and deaths. Dr Nsiah-Asare mentioned that Ghana expressed interest to collaborate with WHO and Partners on the pilot implementation of the RTS,S/AS01 Malaria vaccine and Ghana was selected as one of the three countries together with Malawi and Kenya. Director General also emphasized that the Malaria Vaccine has emerged as an additional tools of intervention to accelerate Ghana’s efforts towards control and elimination of malaria. He that said that from the various trials, the RTS,S/AS01 malaria vaccine has been observed to have an acceptable safety profile and impacted positively on the health of Children. Dr Nsiah-Asare concluded by indicating that the official launch of the MVIP is scheduled for 30thApril 2019 in CapeCoast and the vaccine will be available in all health facilities on the 1st of May 2019. The Director for Public Health, Dr Badu Sarkordie in his presentation on the overview of the Malaria Vaccine Implementation Programme (MVIP) mentioned that implementation will be in the Central, Volta (now Oti & Volta and Brong Ahafo (now Bono, East Bono Ahafo) Regions. He indicated that the selection of these regions was based on a stringent selection criteria and within the regions, 14, 10 and 9 districts have been selected form the Volta, Brong -Ahafo and Central Regions respectively. Dr Sarkordie reiterated that about 120,000-150,000 children are targeted per year for two and half to three years and again at least 50,000 malaria cases are expected to be averted, saving 750 children from dying. He said the RTS,S will be delivered through existing routine strategies alongside other vaccines in the EPI schedule and it was important for all eligible children (6months, 7months, 9 months and 24 months) to receive the full 4 doses of the RTS,S schedule in order to have maximum benefits. In his concluding remarks he entreated the media to support this effort by disseminating this information to the general public. 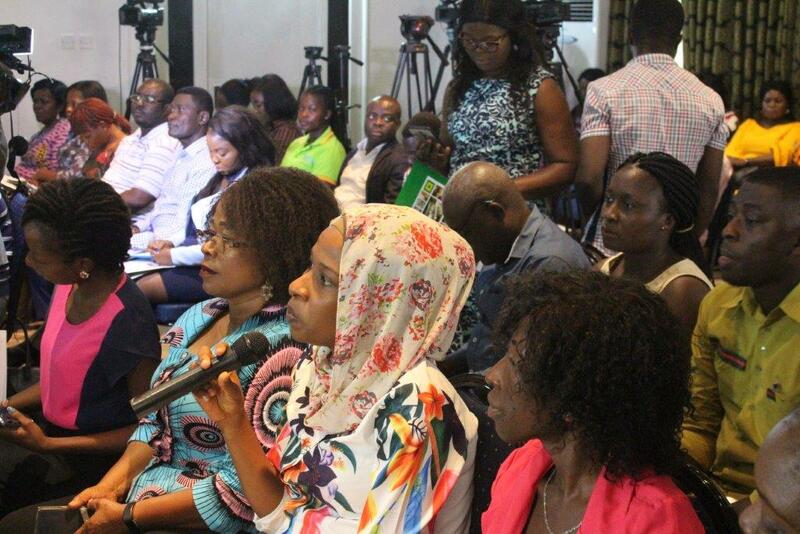 Opportunity was then given for questions and any clarifications and a number of questions came from the media personnel present and were appropriately addressed by the Dr Owen Kaluwa, Dr Nsiah- Asare, the Chief Executive Officer of the FDA, Mrs Delese Darko.